Manchester United's Alex Ferguson Is Retiring : The Two-Way The soccer club's manager will retire later this month. Arguably the most famous coach in the world, he's been in charge as Man U has become one of the most valuable and successful sports franchises on the globe. 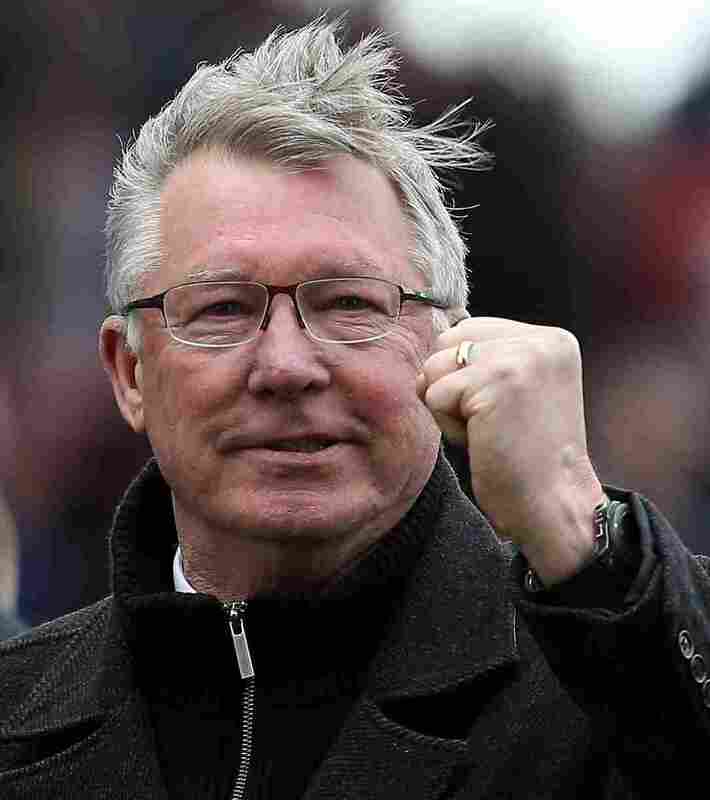 Manchester United manager Sir Alex Ferguson during a match in April. Alex Ferguson, who has managed Manchester United football club for 26 years, is retiring at the end of the English Premier League season, which wraps up on May 19. "Ferguson transformed Manchester United into an international brand, and achieved world wide personal fame. He was the most successful manager in the history of British soccer, winning 38 trophies. "This season, for the 13th time, his team won the highly prestigious English Premiership League. There's speculation that Ferguson's health is a factor in his decision — he's 71 and soon to have a hip operation. "Tributes are already pouring in from around the world to a huge character feared yet deeply respected by his opponents. ... He'll stay involved in Manchester United as a director and ambassador for the club." There's a case to be made that Ferguson is the most famous manager in the world — of any team sport. The effect he's had on his team and on English Premier League soccer is enormous. During his time, the club has not only won championships, but has spread its name around the world as stars such as David Beckham, Wayne Rooney and Cristiano Ronaldo played for Ferguson's Red Devils. Manchester United, according to Forbes, is currently the world's second-most valuable sports franchise. Forbes values Spain's Real Madrid soccer club at $3.3 billion and Man U at $3.17 billion. Spain's Barcelona soccer club comes in at No. 3, with an estimated value of $2.6 billion. American franchises come in at No. 4 (baseball's New York Yankees, worth about $2.3 billion) and No. 5 (the NFL's Dallas Cowboys, at $2.1 billion). Man U is owned by American Malcolm Glazer — something that hasn't always set well with some fans, who wish the club was in English hands and that it hadn't been loaded down with debt in the deal Glazer made to buy the team. -- "1 knighthood, from the queen in June 1999." -- "38 trophies won at Old Trafford" (Man U's home stadium). -- "1,498 games at Manchester United, with 894 wins, 337 draws and 267 defeats." In a new post, Phil writes for us about this "legendary manager for an iconic franchise." As he says, Ferguson's retirement "is an event causing ripples that go way beyond the island where the Scotsman spent his long and illustrious career."